Give your pup fitness style that performs with the Pet Life ACTIVE 'Pull-Rover' Performance Sleeveless Dog Hoodie in Dark Teal. The Pet Life® ACTIVE 'Pull-Rover' Sleeveless Performance Hoodie Tank features a cutting-edge innovative blended micro-fabric with high-stretching properties. When fused together, this material offers higher levels of permeability, breathability, and stretchability. The 4-way stretch woven construction moves better in every direction with a customizable tapered fit without the squeeze and it won't bunch up. The material is extremely lightweight and features quick-drying properties that both repels moisture and odors with antimicrobial technology. This material won't chafe or stick to skin or fur. 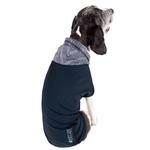 This dog hoodie also offers UV protection against the sun's harmful rays. The perfect fit helps to reign in shedding. 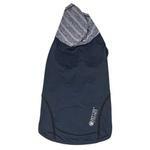 This performance dog hoodie features dual reinforced stitching at every seam for durability. 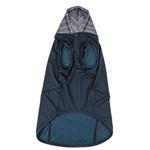 The design features a contrasting thin second skin stretchy hood with a button trim for ease in dressing and removal. Reflective elements offer increased visibility in low-light conditions. Machine washable. 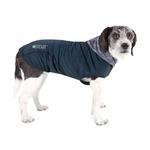 This style is part of our Pet Life® Activewear Collection. Available in multiple sizes and colors. 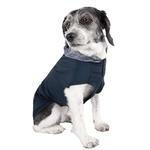 SIZING: Back length is from the collar to the base of the tail. See image chart for sizing approximation. EXTRA SMALL: Back: 9.8" Chest: 47.7" Neck: 13"
SMALL: Back: 11.8" Chest: 17.7" Neck: 14.2"
MEDIUM: Back: 15.8" Chest: 21.7" Neck: 16.2"
LARGE: Back: 19.8" Chest: 26.7" Neck: 18.5"
EXTRA LARGE: Back: 22.8" Chest: 31.7" Neck: 21.2"
I love the efficiency of Baxter Boo. Their site is highly organized, the items are of good quality and the customer service is first rate.